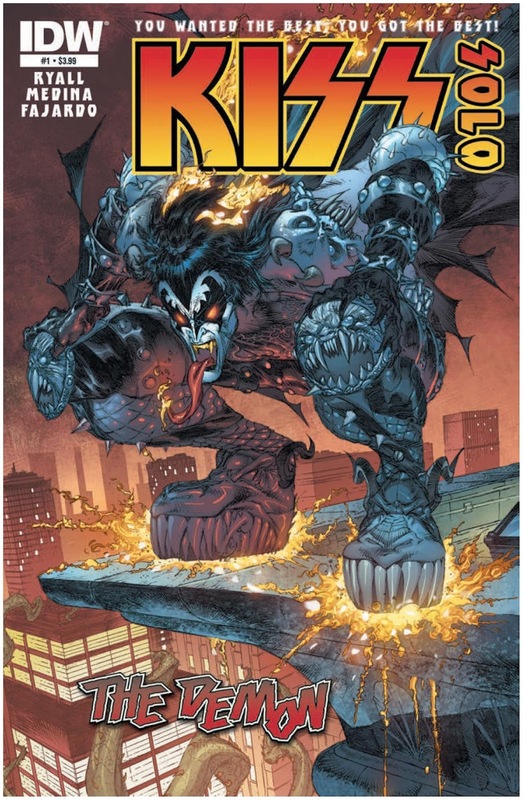 The Fellowship was fortunate enough to obtain a copy of KISS: SOLO #1 from IDW Publishing. The story is by Chris Ryall, art by Angel Medina, colors by Romulo Fajardo, and lettering is by Tom B. Long. The Demon must face the Four Horsemen of Apocalypse alone. At first he finds himself up against the ropes, but he starts to get the upper hand. That is when he is thrown off-guard by an offer from War. Will the Demon consider War’s proposal to join forces and destroy the Earth? Or does he have other plans? The whole idea of the members of KISS being superheroes has been hit or miss with me. While this story isn’t anything I haven’t read before, it was a good story with some great action to boot. It would have been nice to have some kind of explanation on how we got to this juncture for the new readers. Angel Medina’s art is so beautiful, I can’t help to stare at several of the panels and admire his style. If you are a fan of KISS, you know you will pick this book up. KISS: SOLO #1 is in stores now or available at www.idwpublishing.com.